Harry Platcow has contributed greatly to the Jazz Scene in the North East U.S. as a performing musician, radio host, TV producer and prolific photographer. He began his association with music at an early age. While attending grammar, junior and senior high schools in New Haven, CT, Harry Platcow picked up the clarinet in the 4th grade. 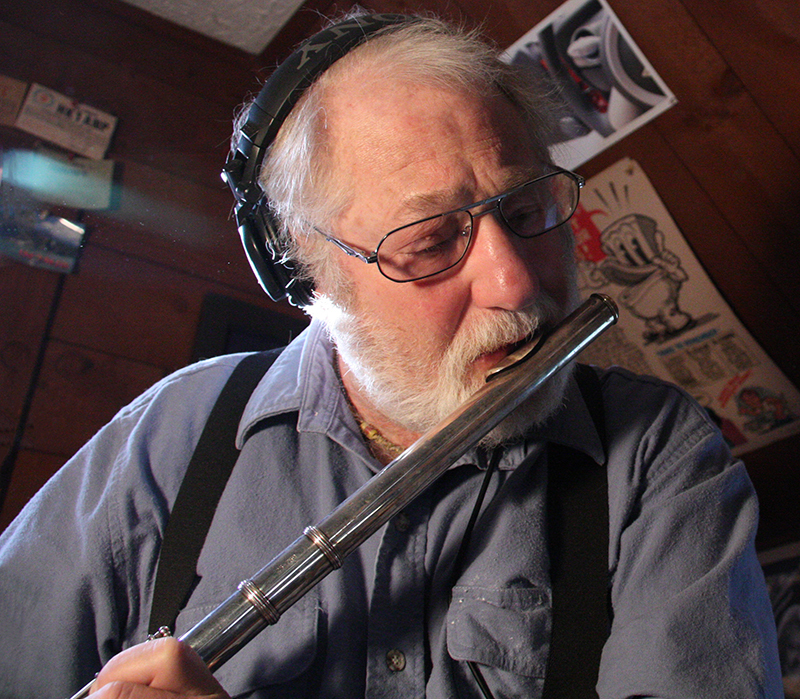 His $10 an hour private clarinet lessons with the famed clarinet player Stanley Zubba introduced him to the music of Tony Scott and Buddy DeFranco at the age of 9 or so. Harry reports that his “Benny Goodman idolization” changed from swing to bop. In high school, he and Larry Sands formed the New Haven Jazz Quartet where they played on Friday nights at the Exit, a coffee house managed and staffed with theology students at Yale. When Harry was age 15 his father brought home an AM/FM table radio. His fascination with radio caused me to slowly tune the dial to hear how the far stations were broadcasting. At this time he was purely into Dixieland, the Dukes Of Dixieland being his favorite with one of the Assunto brothers on clarinet. He was thrilled hear Assunto play melodic lines weaving in and out with the rest of the players. The First Clarinetist for the New Haven Symphony Earl Banquer was Harry’s clarinet teacher who mapped out each lesson with a hand written page of scales (major and all minor scales) and arpeggios. One night on Yale Broadcasting Company (WYBC) he heard music that brought a change of direction: “it gloriously opened my ears and knew I’d be doing this in radio. Back then I was playing tenor and bass clarinet and with Larry on soprano sax we’d play Coltrane’s India and blow those modal changes. My first DownBeat Magazine subscription opted me that album, Impressions. At age 17 and with some flute lessons under my belt I auditioned for the Air Force Band at Westover AFB near Springfield. Doin’ the dog (scales, arpeggios, long tones and changes) the audition was a piece of cake. They filled out the required paperwork that I could take home and gloat over and tell friends and teachers. My future was in the midst of great change.” In the Air Force band he did it all: parades, high school and town concerts, military functions, gigs at the Officers Club and TV shows. Hal McIntyre Jr. was in the band. He mentored Harry into playing lyrically rather than (what he called) “shits of sound” referring to Coltrane’s sheets of sound. He turned Harry on to Al Cohn and Zoot Sims and would write out those duets for the two of them to play. (RIP Hal). After a year of that band, Harry applied for an overseas assignment and received orders to play with the United States Air Force Band Europe in Wiesbaden, Germany. Not even 19, he was seeing Europe from opera houses, concert stages, main street parades, radio shows on Armed Forces Network, and NATO events. The day that France left NATO he recalls playing Souza under the Arc de Triumph in Paris. One Saturday he was listening to AFN and heard a version of Stardust by Tony Scott. Harry says that “Tony Scott’s approach to a ballad on clarinet was almost flutelike”. In the spring of 1968 Don Cardoza came into the Air Force Band as a piano player, arranger and cymbal player. When his wife and daughter moved back to the states they became roommates and with he Don on piano and Harry on bass clarinet they would blow tunes into the middle of the night. It was around this time when Don and Harry would jam with a German rhythm section at a coffee house in Mainz called the Catacombs. Phil Upchurch jammed with them one night. Outpost Berlin was a walled city in the mid sixties. Don and Harry played there yearly for their show-mite parades with troops, tanks and other armaments. He also caught a Carmel Jones performance when he was in the city. On a trip to Afghanistan for an international trade festival, a trombone player smuggled a pound of hash back to Wiesbaden. 18 months later we were busted, courtmartialed and found guilty. With clemency we were sent to a rehab facility in Denver. 9 months later I received orders to run the service club at Niagara Fall International Airport.” In 1973 Harry (who married and under the GI Bill) went to Grahm Junior College. Andy Kaufman graduated a year before him. It was here where Harry majored in TV production and had his first gig in radio at WCSB, closed circuit to the college’s real estate. It was at Grahm where he interviewed Mose Allison, Bill Evans, Buddy DeFranco, Art Pepper and Stan Getz. They were recorded on a Wollensak 10” reel to reel tape recorder. Not being stored properly these interview tapes disintegrated. It was at Grahm were Harry produced 4 TV shows called “Jazz From the ‘Combs” featuring Berklee students and professors. After Grahm College Platcow worked at channel 7 in Boston in their community affairs office. He worked as a tour guide at the station. In 1973, after two break in attempts at his Boston apartment, he and his wife moved to Milford, MA. After listening to WMRC’s Nostalgia Program where the announcer knew nothing about the music and simply played the Time-Life series of the Big Bands, Harry made an appointment with the GM and discussed the program convincing him that he should be doing the show. When asked if he wanted to sell ads Harry said “I jumped on the opportunity. Selling the ads meant writing and producing the spots.” On Nov 16 1974 his son Trevor was born. The Blizzard of 1978 created an awareness for the Air National Guard as they drove nurses and doctors to their assigned hospitals and nursing homes. That year Harry auditioned for the Air Force Band at Cape Cod and was assigned as a clarinet/tenor player. One weekend a month and two weeks a year he’d play Road Races, Summer Band Concerts, Officer’s Club and fairs. In 1981 he was asked if he wanted to be a recruiter. This presented a substantial salary increase compared to a month than what he was being paid at the radio station and allowed him to again be part of the Air Force family. He received a Staff Sergeant’s pay, medical coverage for the family, travel, and plenty of upward mobility. Assigned to the Worcester Air Guard base and listening to WCUW Radio 91.3 FM in Worcester, MA he called during Jack Wertheimer’s show and arranged to meet for coffee. Wertheimer told Harry that WCUW was looking for another jazz host and he was given the nod by the General Manager whom Harry describes as “a cigar smoking lesbian who wouldn’t allow Sinatra played because of his mob affiliation”. After the Worcester Telegram did a feature on Platcow in uniform General Manager locked the door one Thursday as he was going to do a show, according to Harry. Jack Wertheimer was now working at WICN 90.5 FM in Worceter, MA. He suggested that Harry call regarding filling a slot on the station on Sunday mornings from 6-11. He worked 8 years on Sunday Tasteful Blend with a great staff, and an audience that called with laughter, requests, and pledges. It was here where Harry was inspired to interview song writers “to get the story behind the songs they wrote”. David Mann, Arthur Hamilton, Sammy Cahn and jazz pianist Donn Trenner were interviewed. In 1992 Platcow had a mixed state psychosis (a chemical imbalance) and was sent to Andrew Air Force Base in Maryland for treatment, assessment and retirement, after which he had one menial job after another. In 2013 he resurrected the Combs on Milford TV.